Stays elastic and stops leaks quickly. Bonds to virtually all RV materials and adheres to damp, frozen and oily surfaces. Withstands joint movement and temperature change due to RV travel. 25 year life expectancy. 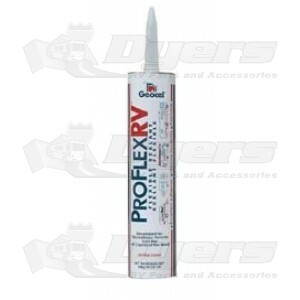 Pro Flex RV Flexible Sealant is specifically designed for the recreational vehicle industry. It can be exposed to adverse weather conditions right after application. Pro Flex RV Sealant has excellent expansion and contraction properties to withstand the joint movement and temperature changes associated with recreational vehicles. It bonds to many recreational vehicle materials, even damp, slightly oily, or frozen surfaces. Aluminum, glass, coated steel (Kynar 500), steel, wood, fiberglass, and vinyl. Pro Flex RV Sealant is based on a proprietary formulation of polymers designed to provide optimum flexibility, adhesion, weather resistance, and life expectancy. Because of the inherent flexibility of this material blend, the sealant does not contain plasticizers (added to many sealants to promote flexibility) which tend to migrate out of other sealants, causing hardening and shortening of their useful life. Due to the mild solvent blend contained in the sealant, Pro Flex RV is not a flammable liquid according to NFPA liquid guidelines. Its inherent weather and ultraviolet resistance, combined with its lasting flexibility, provide a life expectancy exceeding 50 years. Primer: Not required on most surfaces. If primerless adhesion to a particular substrate is in question, a test application is recommended. Contact Geocel’s Technical Service Department for further information. Do not use on traffic-bearing surfaces. Do not use on extruded polystyrene insulation sheathing (Styrofoam, etc.) or EPDM. Do not use on acrylic skylight glazing surfaces. Do not use in areas where food is processed or stored. Not suitable for potable water applications. -Non-traffic bearing joints, including those where structural movement or stress is expected. -Primerless application on most recreational vehicle substrates such as metals, glass, and vinyl. -Where ultraviolet-stable material is required. -Where a paintable sealant is required. -As a trim sealant for metal components. Excellent adhesion to many surfaces, even when damp. Resealable; may be applied over itself. Tools and cleans up easily.